Combine apples and sugar and mix well. Add oil, beaten eggs and vanilla. Mix well. Combine dry ingredients and add to the apple mixture and mix thoroughly. Spread into a greased 9 x 13 pan. Bake for 30 minutes at 350°, then for 15 - 20 minutes at 325°. Cake will get crispy on top. 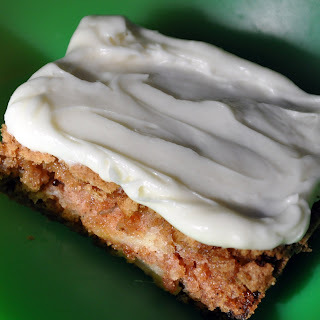 Allow cake to cool in pan and then frost with Cream Cheese Frosting (recipe below). Cream together and spread on top of cooled cake. (Or do what we did and let the cake cool for a little bit and then dollop the frosting on individual, slightly warm slices...mmmmm.) Be sure to either refrigerate leftover frosting or any leftover cake if the frosting is spread over the entire cake. Hi! Don't know how I found your blog but I love it!! So many yummy things I want to try!! I'm just a recipe junkie!! Anyway I made your chicken pot pie and it was a huge hit with the family!! I posted it on my recipe blog ~ one I keep to put all my favorite recipes!! But I listed your recipe and gave a shout out to you and a link back to your blog!! I hope that's ok!! Have a great day!! I guess I should clarify on the pan size, it was a little bigger than a regular 9x13...not sure of the size but it's a white Corning Ware casserole dish I got when I was married! It is a little deeper and wider!! And it still was filled to the top!! 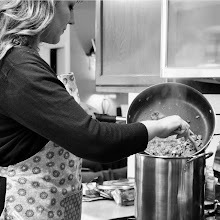 I have two teenage boys and two little girls who really like to eat and a wonderful hubby who likes to take leftovers so I usually double all my recipes! !